The New Zealand native will replace Andy Goode at the Premiership club. 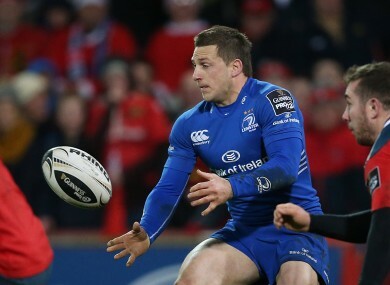 WASPS HAVE CONFIRMED the signing of Leinster out-half Jimmy Gopperth ahead of next season. The New Zealand native joined the Irish province from Newcastle at the start of the 2013/14 season and helped Matt O’Connor’s side to a Pro12 title in that first campaign. However, with Johnny Sexton set to return to Leinster next season from Racing Métro, it was likely that Gopperth’s opportunities in the 10 shirt would have been more limited, while the homegrown Ian Madigan would have continued to provide competition. The once-capped Junior All Black will instead move back to England, where he won Premiership Golden Boot awards in 2010 and 2011. “I have had a great time at Leinster and it has been a brilliant experience and I haven’t taken the decision lightly,” said Gopperth of his departure. “This season is very much still on the line and we are in contention for two trophies and I am looking forward to fighting on both fronts over the coming months. Gopperth also spoke of his pride at representing Leinster’s supporters and admitted to having made “a very tough decision” in opting to join Dai Young’s Wasps set-up. “Jimmy has been an integral part of this environment for the last 18 months or so and will be missed,” said the Australian, before underlining how much Madigan, Cathal Marsh, Steve Crosbie and Ross Byrne have learned from Gopperth. “We are disappointed to lose a player of his calibre and experience but we understand his reasoning. At this stage in his career, he wants to be playing consistently and regularly and the opportunity to go to a club like Wasps was too good an opportunity for him to turn down. Andy Good is the current incumbent in Wasps’ number 10 shirt, but his playing contract expires at the end of the season. Director of Rugby Young did, however, confirm that Goode has been offered a coaching role at the club. 21-year-old prospect Alex Lozowski will compete with Gopperth at out-half for Wasps next season. Email “'I've had a great time at Leinster' - Gopperth move to Wasps confirmed”. Feedback on “'I've had a great time at Leinster' - Gopperth move to Wasps confirmed”.